The Excelsior I, set in an elaborate bracelet by Mouawad. On may 28th, 1971, a sad but inevitable event in mining history occured: operations finally stopped at the Jagersfontein Mine. Not long before, the mine had celebrated its centenary, the first diamond having been picked up in the Jagersfontein valley in the Orange Free State in August of 1870. Although Jagersfontein was the first South Africa 'pipe' or 'dry diggings' to have been established, its fame was always overshadowed by the mines in the Kimberly district, about 130 km northwest. Yet the output of the mine was great enough to inspire the term "Jagers" to denote a diamond with a beautiful faint bluish tint. In addition Jagersfontein was the source of two of the largest and finest diamonds ever found. The earlier of these discoveries caused the most dramatic moment in the mine's history. On the evening of June 30th, 1893, an African picked up an immense diamond in a shovel of gravel which he was loading into a truck; he hid it from his overseer and delivered it directly to the hands of the Mine Manager. As a reward he received £500 plus a horse equipped with a saddle and bridle. The diamond weighed 971 old carats, equivalent to 995.2 metric carats. It possessed the forementioned blue-white color charateristic of the finest Jagersfontein diamonds, especially cleavages, and was of very fine quality, although there were a number of internal black spots, another Jagersfontein characteristic. The shape of the stone was out of the ordinary: flat on one side and rose to a peak on the other, somewhat like a loaf of rye bread. Apparently this is what inspired the diamond to be named 'Excelsior', meaning higher. The Excelsior may justly lay claim to be the 'Great Unknown' of famous diamonds. As will be explained further along, there is no single Excelsior fragment of exceptional size which would have helped to keep its name in the public eye, thus helping keep track of the fragments. In addition, except for having stimulated some interest among local diggers, the finding of such a large stone seems to have made singularly little impact. No account of the discovery appeared in the more authoritative and prestigious British newspapers which often reported lesser discoveries at the time. Maybe if the diamond had been originally been given a less unglamorous name its fame might have spread further outside of South Africa. Yet consider the facts ... before the discovery of the Excelsior the only rival to the stone was the legendary Great Mogul, of Indian origin, generally thought to have weighed 787½ old carats in the rough. The so-called Braganza Diamond, which was found in Brazil in the 1700s and according to some sources weighed 1680 carats, was considered to have been a white sapphire, topaz or light aquamarine, very unlikely a diamond. So the the Excelsior still ranks as the second largest rough diamond of gem quality ever found, only the Cullinan being larger. After various highs and lows the Jagersfontein Mine eventually became the sole property of the New Jagersfontein Mining & Exploration Company Limited, formed in April of 1887. It so happened that on the very day the Excelsior was found the contract between the mining company and the consortium of London firms which purchased the mine's output expired. If the diamond had been found a few hours earlier it would have made a substantial difference in profit to the parties concerned. However, the Excelsior was shipped to the London offices, located at 29 and 30 Holborn Viaduct, of Messieurs Wernher, Beit & Co., the largest of the ten firms that comprised of the London consortium. Wernher, Beit & Co. sought to insure the diamond for £40,000 but could only get insurance to the extent of £16,250. "In addition to the foregoing the Company still retains an undivided one-half share in the 'Excelsior' diamond weighing 971 carats, found on 30 June, 1893, which (although it is impossible at the present moment to place any exact value upon, and therefore has not been stocked at all) will ultimately prove a very valuable asset in the Company." "Since the last meeting a large and very fine diamond of 634 carats, named the Reitz Diamond, has been found, and although neither the 'Excelsior' nor this recent acquisition has yet been disposed of, your Directors have deemed it advisable, in the interests of the present shareholders, to stock the Company's one half interest in both diamonds, but the actual figure, as will be obvious to all, it is most injudicious to state publicly." The Heart of Eternity and the Excelsior I bracelet - a nice contrast of beautiful blue and white diamonds. "Dear Sir, I beg to inform you that the Messrs Wernher, Beit & Co., Barnato Bros & Mosenthal Sons & Co. have accepted your offer to buy your company's half interest in the two stones called the 'Excelsior' and 'Reitz' Diamonds weighing 971 and 634 carats respectively for the sum of £25,000 (twenty-five thousand pounds) cash. "It is specially agreed upon that the price paid above is not to be disclosed outside the Diamond committee or your Board of Directors. "I should thank you to confirm the terms of this letter and on receipt of your reply pay your company the stipulated £25,000 on behalf of the above-named firms. I am, Dear Sir, Yours faithfully, Herrman Hirche." The minutes continue: "Resolved that the above sale be accepted and the Secretary was instructed to confirm the same." Thus was concluded what can only be described as one of the most profitable transactions - from the purchaser's point of view - ever to have been made in the diamond trade. As a result of the sale the Jubilee crystal was cut the following year into two gems. The larger of the two was a rectangular cushion shape weighing 245.35 carats, which would rank as the sixth largest polished diamond in the world. But no buyer appeared on the scene for the Excelsior crystal and eventually in 1903, it was sent to I.J. Asscher of Amsterdam. This famous company, destined to cut the Cullinan diamond crystal, had been founded by Mr. J.J. Asscher (1843-1902). "It was unpardonable that this exquisite diamond was so cleaved that the largest stone cut from it weighed only 70 metric carats. The intrinsic value meant more to its owners than its historical importance, so different from the spirit of the owners of the Cullinan diamond who, in deciding to have the diamond cleaved into nine pieces, insisted that one of the pieces so cleaved should be, when cut, the largest diamond in the world." On the other hand two points should be kept in mind when considering this extract from Mr. Williams' book. First, it will be recalled that the owners of the Excelsior had also been the owners of the Jubilee; no accusation, therefore could be levelled at them of necessarily wanting to place value before historical importance so as the Jubilee had been fashioned to yield one truly exceptional gem. 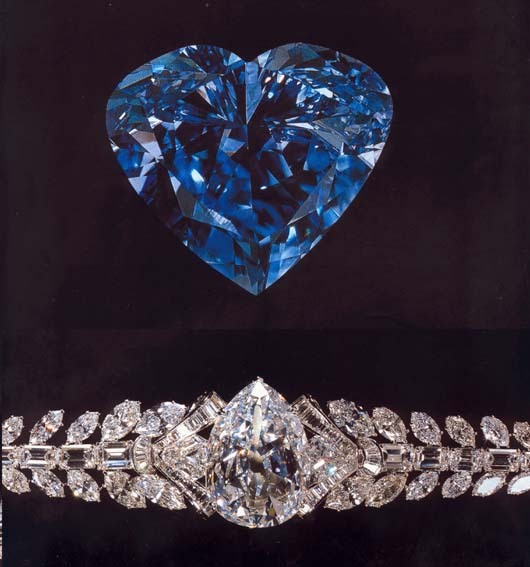 Secondly, a comparison between the Cullinan and Excelsior diamonds is meaningless -- the Cullinan had only one large imperfection in the heart, the Excelsior possessed numerous dark inclusions. Dutch cutters, the world's best, decided this meant considerable loss of weight. The Excelsior gems were sold seperately, three of them were bought by Tiffany & Co., in their old store in Union Square in New York City. The names of the other buyers have not been disclosed but it is known that De Beers displayed one of the marquise-shaped fragments at the 1939 World's Fair in New York. In January of 1984 Graff Diamonds Limited of London announced the acquisition and subsequent sale of five exceptional diamonds among a series of transactions to clients. The most historic stone was the Excelsior I which according to Laurence Graff, had remained in the posession of the same family in the United States until his firm's purchase of it. The gem reappeared for sale in May of 1991. The GIA certified it as 'G' color and VS2 clarity. In May of 1996 reappeared yet again for sale and was bought by Robert Mouawad for $2,642,000. It is possible that two more of the larger gems cut from the Excelsior rough may have come to light within recent years. 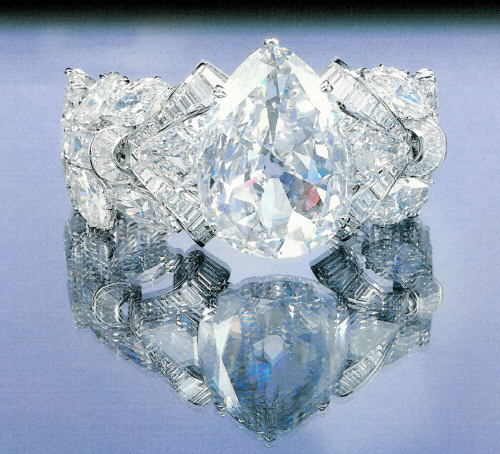 At an exhibition called The Court of Jewels presented by Harry Winston Inc. in San Antonio, Texas in 1949, there was a 40-carat marquise measuring 25.4 by 19 mm. Little appears to have been known about this diamond before its purchase from Harry Winston by a prominent American family. Could it have been the Excelsior IV? On January 23rd, 1957, a diamond necklace with a pendant, owned by Mrs. John E. Rovensky came up for auction at Parke-Bernet Galleries. The pendant was a pear-shaped diamond weighing approximately 46.50 carats. Since it had originally been purchased from Tiffany's, is there not a distinct possibility that this gem was noneother than the Excelsior III?